You have just ordered a box of delicious pizza, topped with cheese, pepperoni, bacon, and olives, and as your cat is greedily prying at your food, it might strike you whether to pamper it or not with it. Well to your disappointment, the answer this time is a NO, as the various ingredients present in pizza is said harmful to your cat. Though a tiny morsel would not affect your cat at the very instant, it is still better to avoid it entirely as it will do no good to it. Garlic and onion which form the main ingredients of pizza, as well as its sauce, are considered toxic to cats, resulting in immense damage. The several toppings that pizza comes along with like pepperoni and sausage is high in salt, which in turn is harmful to felines, also resulting in sodium toxicity when consumed in excess amounts. Its high cheese content may hurt the digestive system of cats, particularly those that are lactose intolerant. 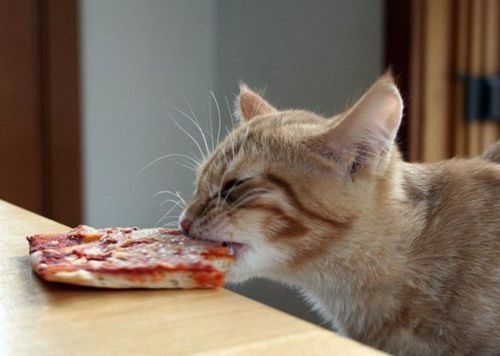 The bread or crusts of pizza are also not good enough since they are made up of yeast and even high in carbohydrates, is difficult for your kitty to digest. If your cat shows any abnormal symptoms after having even a little bit of pizza, do not delay in taking it to a veterinarian.